you might have noticed there has not been many updates recently…. this is because I was intensively preparing version 10. However, I should say that this version also includes many changes I wanted to do long time ago, but never completed so did not include in previous versions. 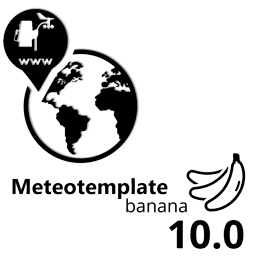 Meteotemplate 10.0 Banana is a major update, probably the most significant update yet, and this includes not just many new pages and things you will see directly on the page, but majority of the code of the Weather Station section – code that I have written over a year ago, while learning PHP, has been rewritten, optimized and some pages done completely from scratch. One thing that you will appreciate especially if you are a new user is that I have completely re-written the data import and database update scripts. There are no more WD.php, Cumulus.php, meteobridge.php etc. scripts… there is simply “an update script”, “an import script”. These now also work totally differently. In previous versions you made a file that was compatible with Meteotemplate for import – now Meteotemplate adjusts based on what your files look like – and so you can now import data and update database with practically any file that contains the necessary information, regardless of its structure. And in addition, this version finally completed my long-term goal – the database update was the very last thing that still had to be set up in the code itself. Now it uses GUI and is accessible from your control panel. And this therefore means, that unless you want to make specific customizations, you can now install and setup Meteotemplate, setup and install blocks and plugins and do admin actions, without ever seeing the code. And this is also a major advantage for me because it gives much less space for potential errors that people can accidentally make when they for example delete a semi-colon etc. Some of the new features might look like minor, but they will also save you time – for example the new “remember me” function – stay logged in as an admin even if you close the browser or shut down your PC until you click the log out button, current conditions in header, site search in footer. Your homepage blocks now also have some new features – a new “header block” and “footer block” further extend the layout possibilities, possibility to highlight important blocks, set names for menu blocks. There is lot of new things, so just keep reading and then especially explore it once you have it installed yourself – btw. the update should be very easy. show current conditions in the header – in the Main settings you can now specify if you want to enable this. If yes then you will see the current conditions on every page directly in the header below the flag icon. The values iterate automatically and you can specify the interval for the change to another parameter. Works also for mobile version. site search – you can now include a search for your whole site in the footer! This can be enabled/disabled in the Main settings. For this to work you will need a Google API key, instructions included in the Main settings file. you can now import data to the database from practically any file or WU. You can precisely define the format of the file and it will automatically import it, no need to adjust the format. This allows importing log files from any software. Before you do the update, let me explain one very important thing – database updates. The database updates are now all handled by a single script, the update.php. This script is much better than the original scripts because it allows much better diagnostics – in other words, if something does not work, I will be able to tell exactly what the problem is. HOWEVER! This means that assuming your updates are already working fine, there is no reason for you to change your updates to this new script. It will have NO ADVANTAGE for you and I would even say – if it works now, just leave it. Not updating the update scripts will in no way affect the rest of the template, the only thing you will not be using is the update setup via cPanel, but again, if it is working now, just leave it as it is. This way there is no risk of any potential problems and also, you do not need to make any changes to your CRON jobs. The new script for updates is very useful, but only to NEW USERS! open the admin folder and replace all the files inside. DO NOT replace the entire directory, this would delete your homepage settings, which is saved there too. So only replace/add the new files that are inside it. open install directory and replace/add the corresponding files, you can also delete the WU.php, WD.php, Cumulus.php and CSV import pages and showColumns pages, these are all now included in the admin folder and handled from the control panel. in your template root folder, replace the index pages, the header, the footer and the menu. on the page where you set blocks for your homepage are new sections for: header block, footer block, highlighted blocks and possibility to give names to menu blocks. Wiki has been updated, but to see how to set the name, you can also click the Brief Instructions and read how to do it. NOTE: It is absolutely crucial that you update your header, footer and the menu! These files were modified and they do not contain just the new links, but also other scripts that are necessary for the template to work now! If you have modified your menu, then it would be better if you took the new one and added your custom links to it, there are many changes in that file in other parts and same goes for the other pages. Some pages were renamed, some are handled differently. E N J O Y !!!!! I’ll tell on myself a bit here — Jachym is trying to coach me along the way step by step. I wanted to demonstrate that I can be useful on my own (a little anyway), so I began downloading various Blocks and Plug-ins — only to have Jachym kindly remind me to follow our plan and not run ahead — thus, damaging the hard work he has already invested in me and my new site. I know I speak for everyone who’s had the opportunity to work with him — THANK YOU! Lors des prochaines mises à jour est-il possible d’envisager une mise à jour (update) beaucoup plus simple – automatique comme le font la plupart des logiciels. Je trouve qu’il est fastidieux de toujours suivre une procédure manuelle qui n’est pas très simple au risque que cela ne fonctionne pas. A part cela je trouve votre logiciel superbe et j’encourage vivement les utilisateurs à participer financièrement à cette élaboration. Tout travail mérite salaire. I see exactly what you mean. Yes, I have thought about this many times, it would technically be possible to do the update just by running one single script. However…. there is a major problem with this. The problem is that many users have various permissions set in various folders. So what could happen is that the update would not proceed correctly. Either it would completely fail (if the permissions for PHP are not “write”, it would not be able to overwrite or add the new files), or, which is even worse, in some folders it would upadte the files and in other folders it would not. This would lead to a complete mess and most likely non-functional site because some scripts would be updated and others not and they are not always compatible. And it would then be very difficult to make it working again because you would have to go one by one, checking which one worked and which one did not. Firstly – Jachym – *thank you* for all your hard work on this, it is simply amazing the amount of things you have gotten done while working and getting your PhD! Second – thank you for including the menu group title/name functions … dumb question about this (and I haven’t yet dug into the CSS to check it out) is there a way to vertically align the name of the menublock with the action/menu button/icon? the problem with this is the menu action button uses absolute positioning. It is relatively complicated to explain, without including all the details of the code, but I know exactly what you mean, and I tried it as well, the problem is that it could cause problems with some blocks, it is all down to the fact that I as a developer have no clue which blocks you included and what is the column width. It is the width that is problematic because if the title was longer than the block width, if I placed it also with absolute positioning next to the menu action button, it could overflow and in absolute positioning it would overflow the block completely rather then creating a new line. Maybe something to try to figure out for version 11 🙂 But it is not something you can very easily adjust with just CSS. What a long way you’ve come from when i first started using Meteotemplate. I can now redesign my entire homepage and add or subtract plugins without knowing or changing any code. And you keep coming up with new features, blocks and plugins. Holy mother of many nights of coding! Just this email/post itself looks like it took a week to compose. ..
Up and running new update! OK, I agree – WOW! This is some incredible work! Ignore my db comment – I fixed it. Google autofill was trying to be “helpful” and I didn’t catch it at first. Are you sure you have time to study yor exam for last friday ??? With all these mazing modification in the new update, where you find the time…. Great JOB !!!! !